Spring 2019 Indoor Basketball Clinic Program. Queens, NY. Book Now. 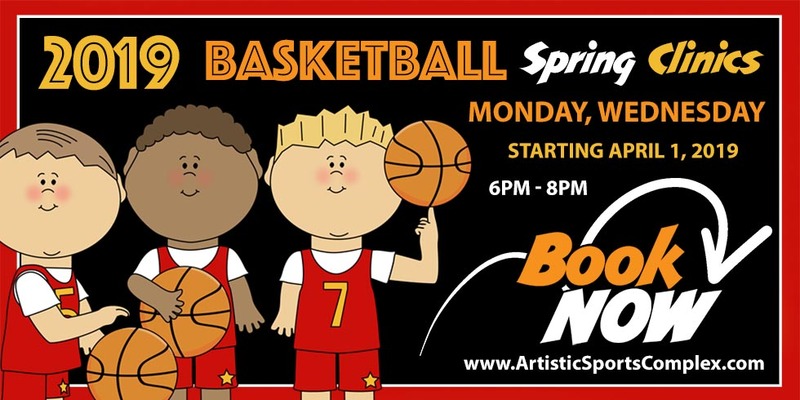 Artistic Sports Complex Basketball clinics training programs are limited in size and are open to kids of ages 6-13 yrs old we offer all levels of play. From beginners to experienced. We split players by gender, age and skill level to make the best training experience. We are offering skills clinics, where players will work on the fundamentals and get to play full-court team games! Boxing out/closing out and more! At our skills clinics, your child will not only have fun, but also receive private instruction on what he / she needs to do to take their game to the next level. Our spring basketball clinic gives you the flexibility to pick and choose the dates you would like to attend (based on availability )..
Booking is done online so be sure to reserve you spot now. Space is limited. before proceeding to checkout (below). All participants must submit a waiver. Refunds may be given up to 15 days prior to start of the clinic minus a $50 non-refundable deposit fee. No refunds will be given within 15 days of the start of the clinic as staffing is determined by the number of participants.